Like all paradigm shifting theories, Thomas Piketty’s argument is at heart extraordinarily simple. When the rate on return on capital (i.e. the return on profits, dividends, interest and rent, or ‘r’) is consistently higher than the rate of overall economic growth (i.e. output, or ‘g’), capital becomes concentrated in ever fewer hands. Piketty’s important statistical work supports this theory with extensive and long-run historical data on wealth concentration. But what does this ‘wealth concentration’ really amount to? And why does ‘r’ tend to outpace ‘g’? The reasons are complex and varied. Here I would like to point out two significant structural elements at the heart of modern capitalism: futurity and leverage. Something very odd happened to wealth during the 2008 economic crisis. US households’ net wealth fell by $11.2 trillion in 2008 – an alarming figure, given that total US GDP stood at about $14.5 trillion that year. Globally, a 2010 study found, the financial crisis ‘destroyed $34.4 trillion of wealth’ by March 2009, amounting to ‘more than the 2008 annual gross domestic product (GDP) of the US, the European Union and Japan combined’. ‘This wealth deficit effect’, it predicted, ‘would take at least a decade to replenish even if these advanced economies were to grow at mid-single digit rate after inflation and only if no double dip materialises in the markets’. In the event, even though most OECD economies stagnated over the next five years, aggregate global household ‘wealth’ returned to 2007 levels by 2013 and surpassed them this year. How could wealth ‘destruction’ on such a massive scale be reversed so quickly during a period of stagnation? What makes this recovery still more perplexing is that it appears to bear no relation to the ‘real’ economy. Whereas nominal gross world production (GWP) stands, in 2014, at about $72 trillion, at the end of 2013 global aggregate household wealth was estimated at $242 trillion. Whereas most economists expect very modest growth in the world economy over the next half decade, global aggregate wealth is expected to increase by a whopping 40% in the same period. In other words, not only do researchers expect r > g, as Piketty argues, but they expect global wealth (much of it will show as ‘r’) to grow at a rate of approximately 8% a year and ‘g’ to grow at no more than 1 to 2% a year. What is going on? In fact, the comparison between wealth and ‘g’ is unfair: we are not comparing like with like. To understand why, we must draw two distinctions. First, we must distinguish between two dimensions of capitalism: the past-oriented economy and the future-oriented economy. The former is an economy of accumulation and investment, in which growth is a product of prior investment in capital and aggregate wealth figures represent the gradual accumulation of capital stock over the ages. From this perspective, wealth concentration is an issue of the distribution of accumulated capital. In the future-orient economy, by contrast, ‘capital’ represents a numerical interpretation of what society believes the future has in store. Capital ‘formation’, from this perspective, is highly volatile, being based partially on sentiment and speculation. Both dimensions are at work in every capitalist economy, and their interaction can generate odd results. One of these is the extreme concentration of wealth. Second, economists distinguish between two forms of wealth: tangible and intangible. The former comprises assets that have a physical presence – real estate, for example. The latter comprises every other form of wealth, for instance ‘human capital’ (i.e. a person’s learning, technical skills, and so on). Tangible assets are those which have been accumulated in the past. The value of intangible wealth, by contrast, is calculated on the basis of their future earning capacity, or put simply, it is future-oriented. Consider David Beckham. Companies which believe that Beckham has generated ‘goodwill’ among potential customers may wish to purchase his ‘image rights’ – Beckham’s ‘image rights’ therefore constitute an intangible income generating asset. Economists measuring household wealth tend to believe they measure tangible assets, which means, given the above, that they also end up focusing overwhelmingly on the past (i.e. on already-accumulated tangible assets). That is why the term High Net Worth Individuals (HNWI) is so common –‘net’ here refers specifically to their wealth minus their intangible assets. Yet most wealth is intangible and future-oriented. Let’s take another example: what is the ‘real’ value of a company like Coca-Cola? Contrary to popular perception, it is not fizzy drinks. Rather, its principal asset is the Coca-Cola brand and its family of associated trademarks. Put differently, the Coca-Cola Company’s principal asset is the confidence of the ‘markets’ that consumers will prefer products bearing the Coca-Cola logo. This predicted future income stream, discounted against various estimated costs, is supposed to account for the market value of the Coca-Cola Company. But this means that the ‘value’ of publicly traded companies lies somewhere in the future (it is calculated on the basis of what is known as the price-to-earnings ratio). In other words, an important component of ‘wealth’ lies in the future! This future-orientated way of measuring wealth originated in an accounting shift that took place in the late nineteenth century. Until then, businesses were valued on the basis of the estimated replacement cost of the physical assets they owned, or on the basis of the estimated market price of the physical assets they owned at a given moment (i.e. the liquidation price). In both cases, businesses were valued as if they had ceased profitable activity. These techniques of valuation suited creditors’ interests, because physical assets meant they’d get their money back in case of failure. But as entrepreneurial culture spread in the advanced economies (the US and UK), a different method of valuation, one better suited to the interests of business owners, came to predominate. This alternative method valued companies as ‘going concerns’ – that is, it reflected not just their past and present incomes, but their expected future income as well. The future dimension adds value to businesses: expected income can be factored into current valuations, which will therefore be above the replacement cost. Asset value denominated against expected future earnings thus contains an ‘intangible’ element. This introduces uncertainty, since future incomes cannot be determined with anything like the same degree of confidence as the current replacement or liquidation value of physical assets. The twentieth century growth of large financial houses, like Goldman Sachs and J.P. Morgan, was closely linked to the development of accounting techniques used to ‘extract’ additional value from assets (assets were, so to speak, ‘put to work’). Today, an estimated 75-80% of global wealth is ‘intangible’; that is, it is wealth that in one way or another capitalises on predicted future income streams to finance present-day consumption. This explains the collapse and rapid recovery of ‘wealth’ following the 2007-8 crisis. When confidence in future profitability drops, enormous amounts of wealth can vanish almost instantaneously (and vice versa). It also helps explain the chasms that can open up between ‘wealth’ levels and economic growth. Growth figures reflect existing consumption, production and services at current price levels. Measures of wealth, on the other hand, represent something far more esoteric: a collective, or market, prediction about future economic prospects. 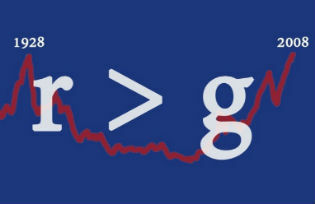 Returning to Piketty, this means that ‘r’ and ‘g’ are competing on unfair terms. The latter is strictly past-oriented and limited to tangible assets, while the former incorporates intangibles and has learned to draw profitably on the future. Counterintuitive as it may be, it is no wonder, therefore, that financial assets tend to rise in value much faster than the rate of economic growth. Whereas the latter is a measure of actual exchange, the former is limited ultimately only by people’s expectations and beliefs. Ironically, the establishment of national insurance schemes by social democratic governments after World War II rested on the very principle identified by Piketty to explain rising inequality. The state-led growth of the financial industry was premised precisely on the belief that ‘r’ would consistently outpace ‘g’. The development of large pension funds, followed by mutual and ‘hedge’ funds of many varieties, was based on the expectation that expert-run funds would reliably beat long-term average growth (r > g), and indeed would reliably beat it by a sufficient margin to enable those experts to claim handsome commissions in the process. In other words, it was premised on the assumption that the financial industry is so efficient and knowledgeable as to be able to generate r > g + c (commission). In the UK, for instance, ‘administrative’ commissions on pensions or endowments’ funds typically stood between 2 to 4% of the annual input to funds. That is to say, these funds operated on the assumption that they could consistently generate r > g + 2-4% on annual basis. Since commission is normally taken at the beginning of a deal and/or on a yearly basis, whereas expected returns were mere promises or forecasts provided by the very people who took those commissions, potential for abuse was rife. To put it mildly, those receiving the commissions tended to be on the optimistic side. Futurity, though, is only part of the story. Equally important is the way the financial system exploits leverage to enable owners of capital to use what they own to control ever greater amounts of wealth. Most of us are familiar with leverage in its simplest form. If you take out a mortgage on your property at a 25% down payment, but gain the full 100% of the increase in value of your asset, you have effectively leveraged your down payment at 1:4. Many people over the past decade saw how their neighbours benefited from this technique and flooded into the housing market to take advantage of it for themselves, generating a demand-led asset bubble. The financial industry could then factor in rising house prices to enable it to reduce the down payment rates for mortgages, to, say, 10%. At this point a leverage of 1:10 could be achieved, prompting further purchasing, and so forth. Much individual wealth accrues through such leverage schemes, rather than accumulated savings from salaries. Piketty’s ‘r’ – the rate of return on capital – is largely determined by a combination of futurity and high leverage. Think, for instance, of the Glazer take-over of Manchester United. Most of the capital used by Glazer to purchase the club came in the form of loans, the majority of which were secured against the club’s assets. Glazer used, in other words, the club’s future earnings as a collateral for a loan to buy the club in the first place. Many fans are complaining, correctly, that in order to achieve control over the club the Glazers mortgaged the club’s future. The Glazers made a bet that the club’s value (as a franchise that generates future earnings) would rise in the future, which it did, and they could pocket the higher valuation. Of course, they also had to make sure that the future prospects of the club remain rosy, and hence continued ‘investing’ in good players. The Glazers tactics are a typical case of the use of financial leverage combined with futurity to increase what might be registered in wealth data as ‘net’ wealth, but which is in reality largely estimation of future earnings logged as assets. The public significance of the holding company, as distinct from the simple business corporation, is twofold. In the first place, the holding company is the most effective device that has ever been invented for combining under a single control and management the properties of two or more hitherto independent corporations… [Second, the] holding company, perhaps more than any other legal device, is being used by business men as a means of avoiding various forms of social control. A crucial weapon in this battle for control is the pyramid, a form of ownership structure that operates through holding companies. Simplified for ease of presentation, the basic strategy works like this. A person or company which owns the controlling stake in a company, controls that company. Current rules allow a company worth $2 billion to control a company worth $4 billion (through 51% stock holdings), which can in turn control a company worth $8 billion, which can control a company worth $16 billion, and so on. Indeed, one need not control even 51% of the value of a holding company. For instance, in a $5 billion holding company, a controller could sell $3 billion as bonds, which would theoretically leave the share value of the company at $2 billion (the ‘markets’ value a $5 billion company minus its ‘debt’ of $ 3 billion at $2 billion). One would thereby achieve control over the holding company through an investment of just $1 billion, and could use the $3 billion proceeds from the sale of bonds for other purposes. Through pyramidal structures of holding companies, any investor with sufficient starting capital to buy a controlling stake in a valuable firm can thus repeatedly dilute their investment in that company and the corresponding risk to their personal wealth without diluting their control of that company (that is, they can leverage their capital to higher and higher factors). This means that those who have either starting capital, or as we have learned from many detailed studies, the audacity or even the necessary contacts with the banking industry, can exert disproportionately high control over capital while suffering disproportionately low risk to their personal wealth. Pyramidal structures of holding companies tend to confuse wealth statistics, because we are never sure whether the figure for wealth that is attributed to say, the Forbes 500, refers to control over assets through such pyramidal structures, which are often propped up by debt, or whether the figure refers to those companies’ true ‘net’ wealth. Following Israel’s own version of the Arab Spring, and the revelation about the pyramidal structures that allowed well connected families to leverage their assets to the point of achieving stronghold over the entire Israeli economy, Israel is now introducing laws limiting pyramidal structures to three tiers, down from the six or seven tiers that are currently typical of its oligarchic interests. Such pyramidal structures are common and serve to leverage control over a great amount of capital with minimal investment. There is scant research on the subject, but what evidence exists suggests that firms, even very large firms, are sometimes used as pawns or ‘cash cows’ by controlling interests in order to maintain such pyramidal structures. The upshot of all this is that there is considerable ambiguity about the concept of wealth and how to measure it. When Piketty argues that the product of r > g is the ever increasing concentration of wealth, it is unclear whether what actually results is the concentration of wealth or the concentration of control over wealth. Much apparent wealth may be propped up by mountains of debt which due to the complexity of company holdings and a variety of financial instruments, including swaps arrangements and loans, are not easily detectable. In Israel there is currently considerable public debate and research on such pyramidal structures. This has shown that in many cases, the luxurious lives of the wealthy have been largely based on their control over immense assets, rather than their ownership of them. The fall from grace the largest family controlled conglomerate, ADB headed by the Dankner family is a case in point. Although Dankner’s personal future was valued in excess of $5 only three years ago, when he lost control over a key tier in his pyramidal holdings of some of the most valued Israeli companies (by order of the Courts), it became clear that he was in fact a net debtor to the tune of $200 million. Quite a few Israeli billionaires have proved on closer inspection to be of rather modest means. I suspect Israel is not an exception. Piketty’s work is clearly of great importance, both intellectually and politically. But if we wish to understand how wealth is centralised, concentrated and deployed, it is important to understand that the category of ‘wealth’ is not as straightforward as conventionally thought. Personal wealth, particularly of the very wealthy, is a much more volatile category than many other economic measures, because it tends to measure in one way or another future income, which fluctuates tremendously and at the same time wealth is leveraged in the market. As the saying goes: once one reaches a certain degree of wealth it does not matter exactly whether one is in credit or in debit. Ronen Palan is Professor of International Political Economy at City University London and co-author of Tax Havens: How Globalisation Really Works. S. Mitra Kalita, ‘Americans see 18% of wealth vanish’, Wall Street Journal (13 March 2009), http://tinyurl.com/n2tz2fh. All dollars US$, unless otherwise stated. Henry C.K. Liu, ‘The crisis of wealth destruction’, Asia Times (13 April 2010), http://tinyurl.com/kwcdlnh. Credit Suisse, Global Wealth Databook 2013 (Zurich: Credit Suisse Research Institute, 2013), http://tinyurl.com/oxd7kcg. James C. Bonbright and Gardiner C. Means, The Holding Company: Its Public Significance and Regulation (New York: McGrew Hill, 1932), pp. 5-6.